Get the pool you have always deserved. Welcome to Greater Atlanta Pool Service. Family owned and operated for 46 years. Specializing in custom made vinyl liners, safety covers, equipment repair/replacement, and plastering. We are fully licensed and carry liability insurance. No job is too small & all work is fully guaranteed. Our company has grown tremendously over the years, and we have been passing expertise in the industry down for generations. Our primary method of marketing has been word of mouth, and that is because we stand by our work and our customers stand by us in return. We will treat your pool as if it were our own. 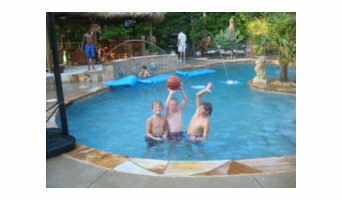 AppleRidge Pool and Spa is a full service swimming pool company located in Acworth, Georgia offering design, construction, repairs, renovations, equipment sales, backyard products and maintenance programs that cater to your needs. As authorized dealer and warranty center, we strive to fulfill your swimming pool needs by providing consistently high quality customer satisfaction and with over two and a half decades of industry experience, we deliver knowledgeable and dependable service. Please feel free to contact us with any questions or to obtain more information on our services and products.